Home/Constipation, Nutrition, Picky eating/Should You Hide Vegetables in your Child’s Food? This is a loaded question that many parents feel strongly about. My answer, based on working with many picky eaters, is: yes and no. Please allow me to explain why it is both yes and no. 1.If you have an extreme picky eater (they eat maximum 10 foods all together), then your best bet is to hide vegetables in your kid’s food. Many picky eaters shudder at the sight of vegetables, so the chance of them trying a new food is quite slim if the vegetables are visible in their meal. If they won’t try the food, then they won’t be exposed to new tastes and smells and they won’t learn to enjoy the food. In addition, many picky eaters don’t get the nutrition their body needs and which vegetables provide. 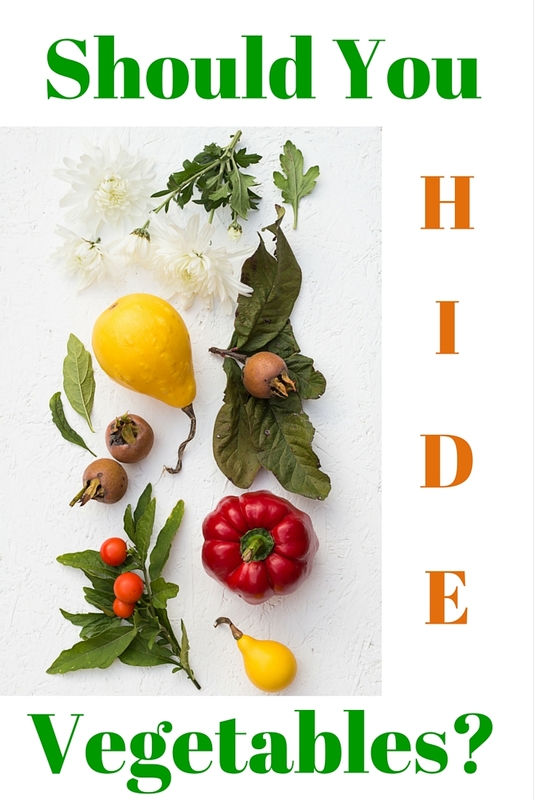 If they are willing to eat a food that has hidden vegetables they wouldn’t otherwise eat, then it is best to hide the vegetables in their foods now and slowly work with them to open up their palate. As your picky eater slowly learns to enjoy more foods, you can involve them in the preparation of these meals. They will not only see what ingredients go in the meal, but you can also talk about the ingredients during preparation. Have your child smell, touch, and taste the ingredients. Your child won’t start eating new foods overnight, but if you expose them regularly to new foods and stay consistent with this process, sooner or later they will expand their food choices and it will all be worth it. Even if it is hard to believe now, trust me, it will happen. If you need some ideas on how to include more vegetables into your child’s diet, here are 3 lists with 23 practical tips I compiled for you. I don’t think I ever told you the story about how I helped my son finally eat and enjoy cherry tomatoes. I won’t go into details now as it is quite a long story, but I promise to share it with you next week. 2. If your child enjoys a wider variety of foods (at least 10 foods) and is willing (even reluctantly) to try new foods, then your best choice is to be open about the ingredients in each meal. You can still include vegetables in all of your cooking and baking, but you don’t have to hide them from your child. However, like in the first case, my advice is to keep offering your child new foods regularly. Even if they are okay eaters (or good eaters), you may still want to broaden their palate. Teach your child to enjoy new foods and stay open about trying new foods. This is a great, but underemphasized life skill they need to stay healthy. What I do in my home: I don’t hide vegetables in my kids’ foods. I used to do this, even if they were good eaters, as I was afraid they would refuse the foods I offered them (talk about my own preconceptions!). These days, if they say they don’t like a particular food because it has, let’s say mushrooms, I calmly remind them that they ate and liked the food before and that I cut the mushrooms into such small pieces that they won’t notice them. Telling my kids that the foods they don’t like (or they think they don’t like) are cut into small pieces and do not have an effect on the flavour of the meal usually (but not always) stops the complaints. However, for you and your child things might be different, depending where your child is at: are they refusing most foods or are they quite good trying new foods (or they are somewhere in between)? One more thing. The answer to the question “Should I hide vegetables in my kid’s food?” comes down, in my opinion, to this: do what is best for you, your child, and your family. Do what feels right and what you think benefits your child now and later on in life. What about you, do you hide vegetables in your child’s meals? I would love to read your thoughts on this matter! P.S. Have you checked out the “Constipation 101 – How to help your child poop every day” program? I teach you how to help your child have regular and effortless bowel movements and how to help your child be less picky about trying and enjoying new foods.